It’s no secret that Homefront: The Revolution has suffered through straight up turmoil throughout its four-year development cycle. Its original publisher, THQ, shut down entirely, leading Crytek to acquire the rights to the franchise, though this ended shortly after Crytek suffered notable financial hardship, leading Deep Silver to acquire the rights in order to put Dambuster Studios at the helm. To be fair, all of the original Crytek UK team members were transferred over to Dambuster, though the sheer amount of chaos surrounding Homefront: The Revolution is not lessened by this fact. This particular development cycle was so rough that Dambuster Studio Head Hasit Zala actually led off the ending credits with a statement acknowledging the hardships. Things could have gone one of two ways for Homefront: The Revolution: success in the midst of tumult or the overall quality of the final product suffering immeasurably. Unfortunately for all involved, the latter turned out to be the case. Players take the role of Ethan Brady, your standard everyday silent mid-thirties male protagonist, with the central goal of bringing down the oppressive North Korean regime, known as the KPA, that has taken over America. Brady is welcomed into a ragtag group of revolutionaries who have grown sick and tired of Philadelphia existing as a military state. You see, Homefront: The Revolution is an unabashed take on the lingering fear of what could happen if real-world America defaulted on its debt to China. In this universe, North Korea is the manufacturing giant that exports its technology and products to the rest of the world as well as the nation that other nations flock to in search of loans. We’ll probably never know why Dambuster Studios and Deep Silver (and formerly Crytek UK) decided not to make Homefront: The Revolution a game about relations between America and China going awry, but the core idea is close enough to the real-world fears of the masses that it’s easy to see what they’re going for. Homefront: The Revolution‘s greatest success is its core concept, as it’s hard for anyone with any semblance of political knowledge to not at least consider the grim alternate future where the U.S. defaults on its debt. Add in the fact that North Korea built in a way to turn off every one of its manufactured electronics and weapons exported to America, and Homefront: The Revolution manages to capitalize on our fear of losing all connection with the technology we rely upon. Unfortunately for players, both the execution of this core concept and the central narrative itself are deeply flawed, so much so that a fascinating idea loses nearly all semblance of impact or emotional resonance. Whether it’s through a heavy reliance on fetch questing or a cast of characters that feels more archetypal than dynamic, Homefront: The Revolution‘s story doesn’t feel as epic as its subtitle suggests that it should. All of the standard characters you’d expect from a military shooter are present: from the violent borderline psychopath to the hardened soldier all the way to the one guy attempting to take the moral high ground. If you were to pull any of the characters Brady encounters throughout the course of the central narrative and stick them into, say, Battlefield 3, they’d fit in seamlessly. Every performance is stiff and slightly awkward, making it tough to fully immerse yourself in the narrative Dambuster is attempting to tell. It’s also worth noting that Homefront: The Revolution sports an all-time corny conclusion, so if you’re looking for a story that does its central premise justice, you might want to look elsewhere. Coming off of titles that manage to inject humanity into its characters like Uncharted 4, Rise of the Tomb Raider and The Witcher 3: Wild Hunt, Homefront: The Revolution‘s characters feel like they’re out of a game in 2006 as opposed to 2016. Granted, one could argue that because this is an open-world title that’s focused more on taking territories and winning over the hearts and minds of the people (we’ll dive into this more later), certain concessions can certainly be made when it comes to performances and writing. The big draw for Homefront: The Revolution, however, is the idea of getting in on the ground floor of a revolt against an oppressive power. Most gamers are going to be giving the Homefront franchise a second chance because its narrative has the potential to be powerful, but in the end it winds up being a fairly bland, by-the-numbers routine. Though Homefront: The Revolution‘s core story leaves a great deal to be desired and its thematic execution feels like a missed opportunity, its gameplay is perhaps its most disappointing design element. 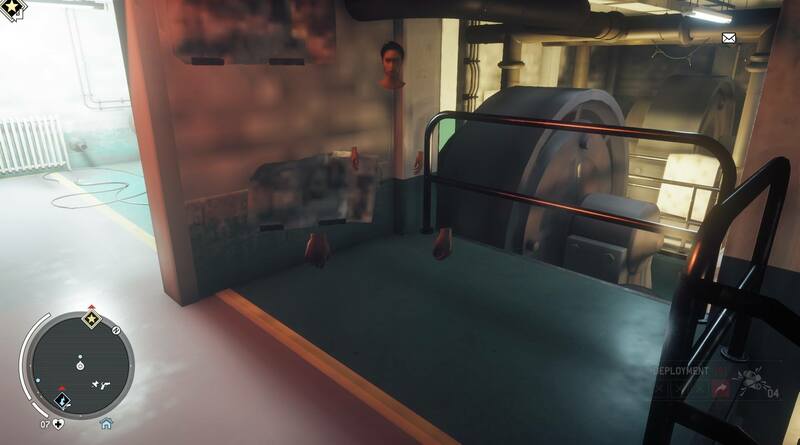 While there is certainly a fair amount of medium-to-large gunfights in the main campaign, the vast majority of your experience is going to be spent in stealth. The thing is, outside of line-of-sight triggering and enemy vision cones, Homefront: The Revolution doesn’t necessarily have any stealth mechanics that directly affect the moment-to-moment action. Stealth here means simply holstering your weapon (which does not appear to have a dedicated keybinding on PC), crouching and not shooting. 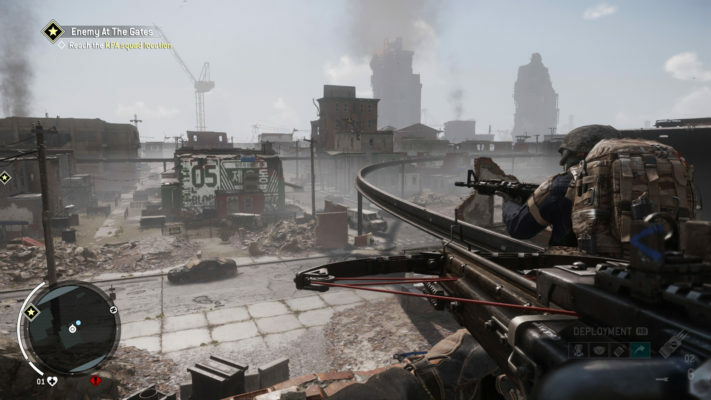 The map of Philadelphia is divided up into Yellow and Red Zones with the former allowing Brady to blend in with the public and the latter involving shoot-on-sight law enforcement, so Homefront: The Revolution is more of a stealth game than a true first-person shooter. 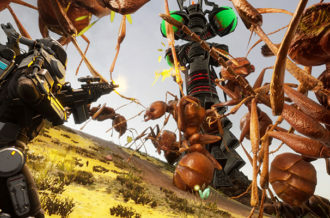 This would be far more engaging if the entire experience wasn’t mechanically built around first-person shooting. There are a number of choices that feel indicative of Homefront: The Revolution‘s tumultuous shift between developers and publishers, and this dichotomy is front and center. In terms of tightness, Homefront: The Revolution‘s shooting feels like it falls somewhere in the middle of Fallout 4 and Far Cry 3. 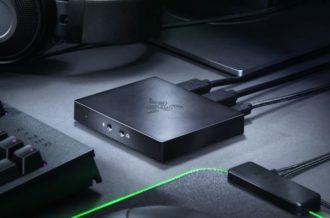 While it isn’t the most mechanically sound first-person shooter to come out this year (or in the past four days for that matter), there is certainly a satisfying punch to the proceedings when playing with a controller. As was mentioned in the previous paragraph, there’s not a dedicated keybinding option at this time for holstering your weapon, which is absolutely critical for blending in in low-security Yellow Zones. This is indicative of the fact that this feels like the rare first-person shooter that feels better when using a controller instead of a keyboard and mouse. Sadly, despite its shooting falling on the right side of average, Homefront: The Revolution‘s combination of dreadful enemy AI and occasionally broken hit-boxes make every combat encounter feel like a slog. Enemies will often stand in one place, completely ignoring the need for cover, and it’s painfully simple to lure an entire group of foes around a corner for easy kills. While actually connecting with an enemy does feel somewhat satisfying, we encountered a shocking number of times where perfectly aimed bullets simply didn’t connect. In a month where both Doom and Overwatch are set to launch, it’s blatantly clear that those looking for rock-solid first-person shooting should look elsewhere. 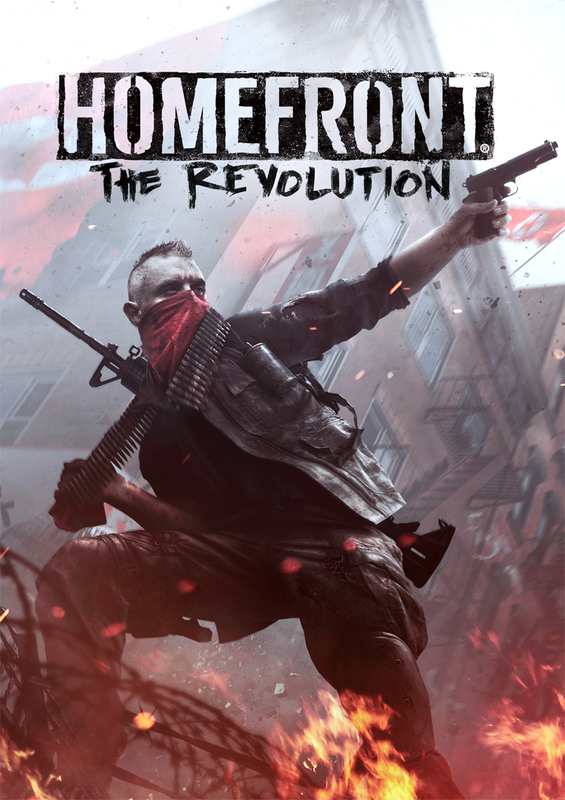 Easily the biggest difference between Homefront: The Revolution and the original Homefront is the former featuring an open world. 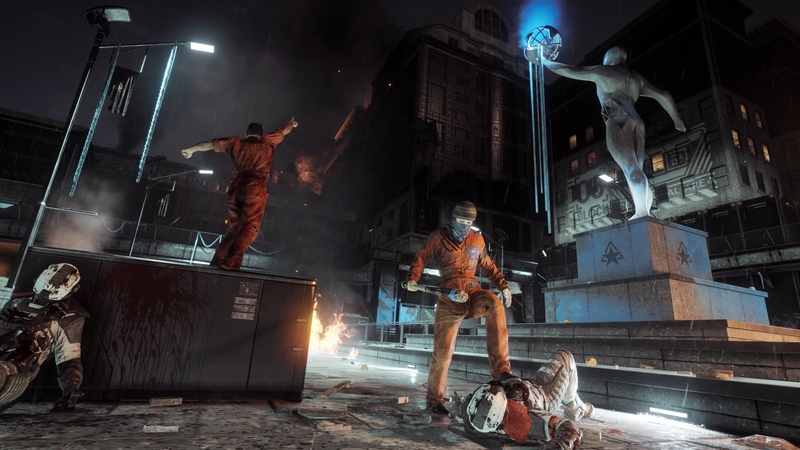 Similar to the Far Cry franchise, Homefront: The Revolution features a map made up of distinct territories, each with a different Hearts and Minds meter that indicates your progress towards overthrowing the KPA in that area. Every side mission and small activity contributes a certain percentage towards a given Hearts and Minds rating, with the former giving you massive increases towards your end goal of capturing a central location and inciting a full-fledged takeover. 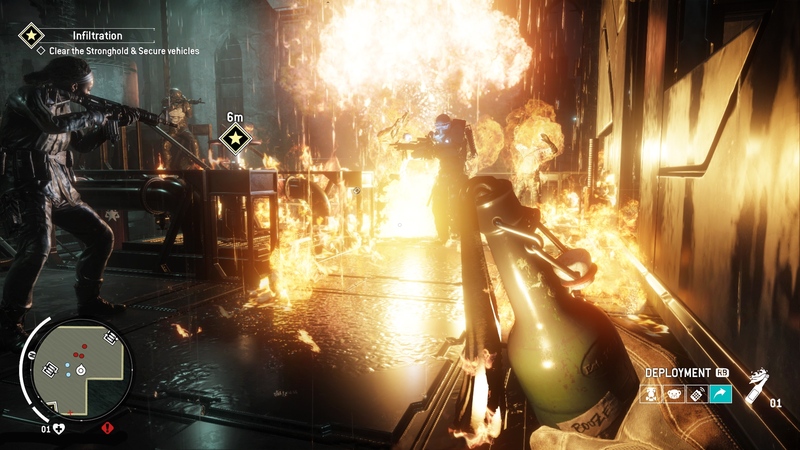 While this system is actually pretty engaging at its core, the vast majority of the side missions in Homefront: The Revolution are focused around some of the clunkiest first-person platforming seen in years. The vast majority of the side missions in Yellow Zones involve wandering around the outside of a building, looking for the lone way to climb up, jumping from balcony to balcony and then activating some sort of button prompt. The Red Zone missions are not necessarily much better, with about a fifty-fifty split between small skirmishes and heading towards the objective and pressing a button. 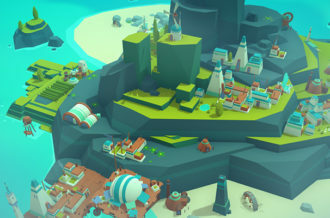 Without the presence of the Hearts and Minds meter, as well as spontaneous battles between the KPA and the revolutionists, there would be little to no reason to engage with the open world activities, causing this to feel like one of the more sterile examples of the checklist-style open world title that the AAA development industry has come to adore. Homefront: The Revolution‘s single best mechanic is its weapon customization system, which fits right into its hope of simulating guerrilla warfare. Base weapons, such as your pistol or assault rifle, can be retrofitted with major attachments that convert them into entirely different gun types (such as a submachine gun for the pistol and a light machine gun for the assault rifle). On top of this, different scopes, muzzles and under-barrel attachments can be fitted to each weapon on the fly, allowing you to completely alter your strategy in the midst of combat with a few inputs. Despite the fact that some of the attachments feature painfully corny cosmetic details, namely one of the sights sporting a “U mad bro?” etching, the general look and feel of each gun fits in with the idea that the KPA essentially eliminated every modern weapon from America. Each weapon, with the exception of the rocket launcher, has accents like bungee cords, scratches and paint chips, which definitely strikes the “Hey, that’s pretty cool,” nerve. The one flaw with this weapon system is that after about half of the campaign, you’ll likely have every bit of gear you’ll want, making the entire system feel a bit pointless towards the end. Still, if the rest of Homefront: The Revolution was as cool as its weapon customization system, it’d be one hell of a game. 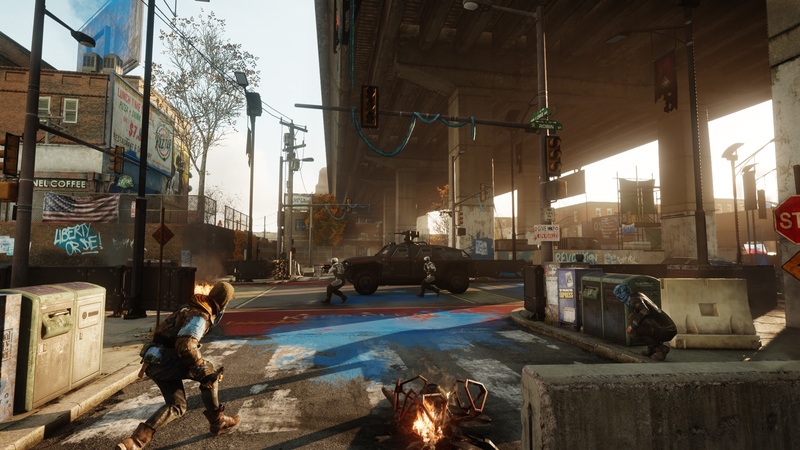 In addition to its single-player campaign in open-world militant Philadelphia, Homefront: The Revolution sports Destiny-style Strike missions in its Resistance Mode. Up to four players can head through different online missions where they’re tasked with infiltrating enemy outposts, fighting off waves of enemies and completing various other objectives in this stand-alone mode. 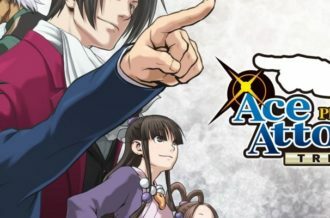 Despite these missions seeming like they would be a good fit in the core campaign, this does add a bit of dynamism to a game that is sorely lacking in that category. The bad news? At this time, it’s currently impossible to get into an online match, as the servers simply will not allow for any type of matchmaking right now. Whether or not this continues to be an issue is anyone’s guess at this point, but considering that Homefront: The Revolution is one of the worst-performing PC games of the generation, it’s hard not to wonder whether or not there will be further issues down the road. Despite the fact that Dambuster Studios has updated the current build of Homefront: The Revolution to the point where we were able to reach the final credits, it’s still easily the worst PC port I’ve experienced since Batman: Arkham Knight (a game that ran at fifty to sixty frames-per-second on this very same rig). Despite playing through the entirety of Homefront: The Revolution on a high-end rig (i5 4690k, GTX 970 with 4GB VRAM, 16 GB RAM), the sheer amount of performance issues and bugs that arose are simply too great at this time to warrant any sort of launch-day recommendation. Open-world areas see the framerate fluctuate from five to sixty frames-per-second at an unpredictable rate and every save point causes a multi-second hitch that caused double-digit deaths (enemy bullets still register during the dead-period during a hitch). Homefront: The Revolution sports some of the most blatant texture streaming issues we’ve seen in any game to date, with areas right in front of you often requiring up to ten seconds to fully render textures. These issues persisted even after multiple restarts to clear RAM, three reinstallations (on both an SSD and an HDD) and verifying game cache three times. In addition, fiddling with the graphics settings had absolutely no effect on performance, with major framerate and texture streaming issues persisting on low, medium, high and very high settings with AA and post-processing both enabled and disabled. 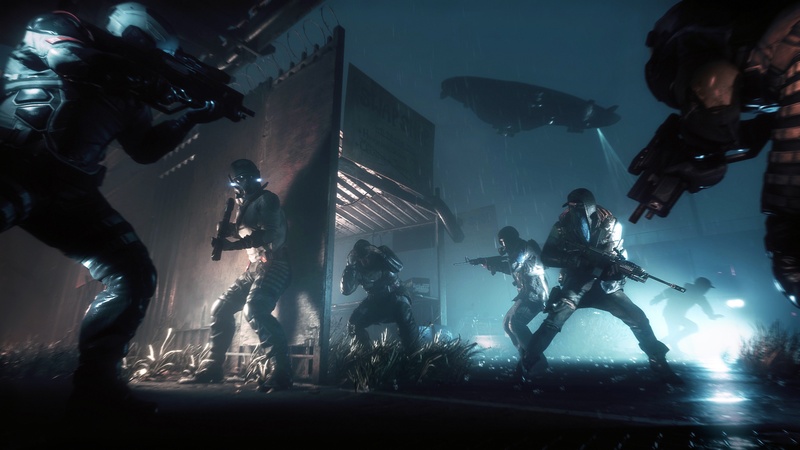 In addition to the massive amount of performance issues facing Homefront: The Revolution on PC, the number of bugs encountered throughout the course of the campaign was staggering. We encountered everything from enemies going completely invisible and not rendering, yet still firing bullets, to health packs actually causing hitches that result in instant death. There were moments where audio vanished completely, NPCs clipped through the floor during dialogue and button prompts completely failed to appear. The latter issue was nearly game-breaking as the central prison in the Restricted Zone completely lost the button prompts on its two entrances roughly 75% through the game, making it impossible to enter the building. Luckily when this occurred, I was at a point where I didn’t necessarily need to come back, so after around twenty minutes of being trapped inside of an empty building, attempting and failing to bring up the map, I was able to fast-travel out of the sector entirely. Despite Homefront: The Revolution‘s tumultuous development, it’s simply unacceptable to be accepting payments for a game that is currently in this state. While Homefront: The Revolution had potential to be great, its mediocre gameplay, lackluster story and myriad of technical issues make it one of the biggest disappointments of the generation. 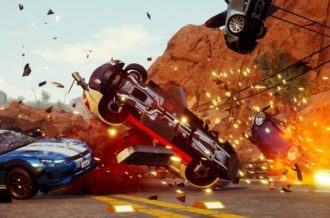 The PC’s iteration’s disastrous framerate and texture streaming follies take what could have been a halfway decent game and make it a pure test of patience on the part of the player. Even without all of the bugs and performance issues, Homefront: The Revolution‘s moment-to-moment gameplay feels dated, and in a month where so many dynamic first-person shooters are launching, this stands out even more. You have to hand it to Dambuster Studios for at least being able to get a 1.0 build out the door, considering all of the hardships surrounding Homefront: The Revolution‘s development, but unfortunately that’s not enough considering the state of the launch release. While it was nice to see another crack at bringing the Homefront name to prominence, the low quality of the series’ second title will likely mean the end of the Homefront franchise for good.